Curling is one of the Winter Olympic sports whose origins are related to Scotland, since this is where the very first evidence of the sport was discovered. This game can be played by teams of women or men of different ages and requires little strength. Curling is a sport that has been played for nearly half a millennium and the game can be traced as far back as 1540 in Scotland. Over time, curling spread from Scotland to Canada, America, Switzerland, Sweden, Norway, and New Zealand. The first international curling events were recorded in the 19th century in Europe and North America, but only at the 1924 Winter Olympic Games was the first, official international competition for men’s teams recorded. Royal Caledonian Curling Club, founded in 1838, is the oldest curling club in the world and the first ever rules of curling were written in the club. 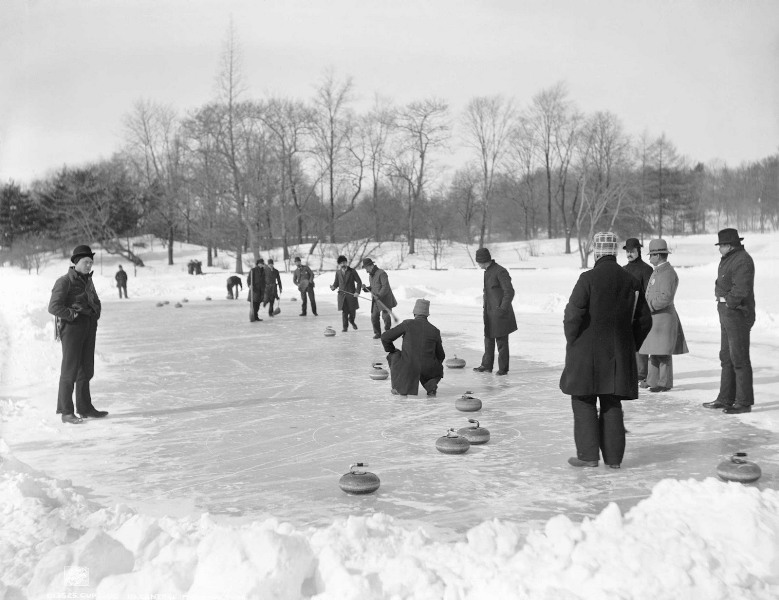 The early curling games were played outdoors, since ice rinks did not exist. A frozen lake, stones, and wooden brushes were the elementary markings of curling. Today, the development of technology transformed what curling looks like. First of all, games are played on ice sheets where ice temperature is controlled using manufactured granite stones that must have prescribed weight. Curling is played on a field 44.5 m long and 5 m wide, using granite stones that weigh 20 kg. Both ends of the field have two sets of four concentric circles with hacks on the very ends of the field. The player uses hacks to push off for the shot and deliver the stone. 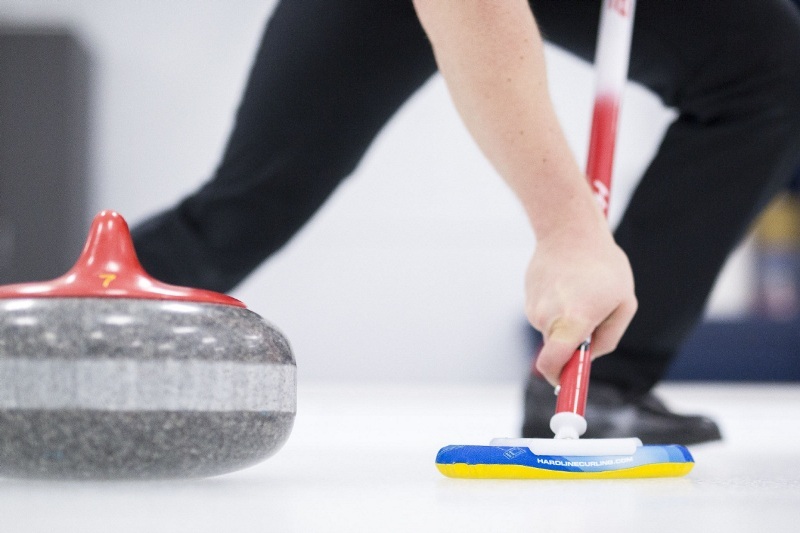 As for teams, curling is played in two teams consisting of four players who use brushes and brooms to try and push eight stones each as near to the center of the house as possible. Teams can be men’s, women’s, or mixed. The sport requires special shoes and brush. Shoes are comprised of a slider, worn on one leg and used for sliding, and a gripper, worn on the other leg and used for improving traction. According to the rules, the slider is worn on the leg opposite of the hand used for throwing the stone. Curling player would rather lose than win unfairly. In addition to the basic there is also the additional equipment, such as special gloves, aids for exiting the hack, stopwatch for measuring the time it takes to throw the stone. In short, curling is played by two teams competing to be faster in pushing the stones from one end of the field to the other, where a big round target is located. The end goal is to have as many stones as possible near the target center as a team and to determine team skills of the players. The spirit of curling in a certain way represents the players’ code. It is actually the mutual respect among the players, as well as for the game itself. There is even a proverb saying that a curling player would rather lose than win unfairly. Respecting other players is one of the basic principles of the spirit of curling. A player who adheres to this code will never try to put competitors in an awkward position by unsportsmanlike conduct or by breaking the rules. It could be said that the spirit of curling requires honorable, kind, and sportsmanlike behavior. Regardless of whether competitions are professional or amateur, the spirit of curling plays the key role, since there are no judges for the sport in most countries. Curling has been an Olympic sport since 1924. Today, curling is a global sport played in Andorra, Austria, Bulgaria, Belgium, Netherlands, Croatia, Serbia, and many others, while Canada has the highest number of players. The significance of curling as a sport is also evident in world curling conventions that have so far taken place in Denmark, America, Serbia, and this year in Sweden. This is one of example of sport in which your employees could participate, in addition to bowling, games in adrenalin parks or in escape room, or in a little bit less active game – in team cooking. Previous articleHybrid events – What is important when organizing one?